Passengers flying at General Mitchell International Airport in Milwaukee are now greeted by a stunning new baggage claim area that opened in July. The high-traffic area needed a durable interior and exterior material that also improved the aesthetics to enhance passengers’ experiences. This was accomplished by a single-source supplier, Dri-Design, which manufactured Shadow Series wall panels, standard flat wall panels, and column covers for the renovation and expansion project. The 0.080-inch aluminum standard and Shadow Series wall panels were finished in Bone White and Bright Silver. They were installed by Architectural Products of Wausau, Wausau, Wis. Shadow Series panels can be manufactured with varying depths. This freedom to design each panel gives you an unlimited capacity to create a dynamic, one-of-a-kind surface on nearly any façade. The substrate or weather barrier do not need to be modified. This three-phased project took place from September 2013 to July 2015. 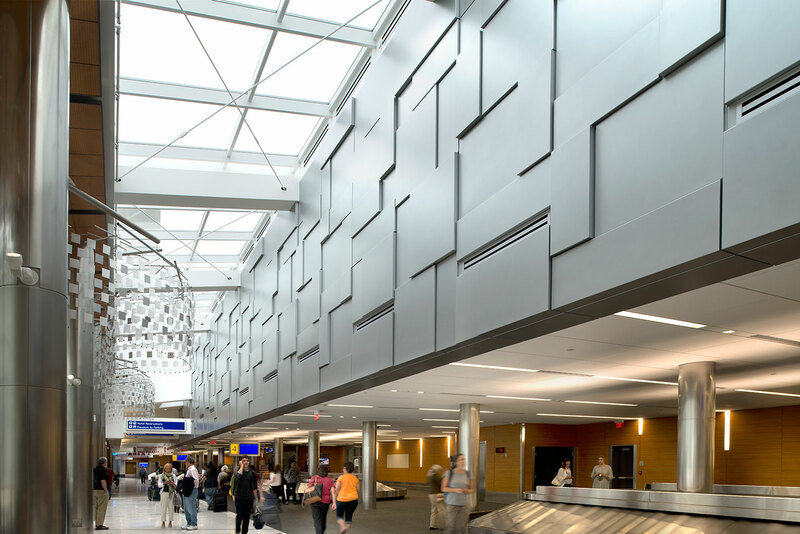 Working on an existing building required coordination and scheduling; the owner did not want to disrupt the more than 800,000 passengers who travel through the airport each month. Some wall panel details had to be determined on site to conform to existing conditions that were not apparent during the design stages. Dri Design worked with the architect and contractor to provide the most appropriate solutions. The project addressed 45,000 square feet of space in the basement to accommodate five conveyors, two data rooms, other updated rooms, and new and updated building systems; 45,000 square feet of space on the first floor, including five carousels, seven entries, north and south lobbies, gathering space, seven baggage service offices, general offices, ADA restrooms and vending areas; and the second floor added 4,000 square feet for 10 offices, as well as new north and south mechanical penthouses for HVAC and electrical systems.